Earlier today, there were reports in the media that Shatta Wale had thrown longtime girlfriend Shatta Michy known by the real name, Diamond Michelle Gbagonah out of his house for an alleged incident of cheating. 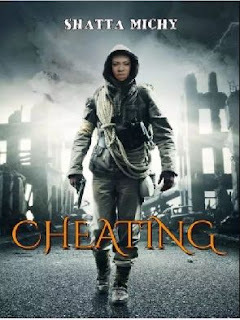 It however appears that the incident happened to transform into a song by the “Shatta Movement Queen” which is going to be titled, “Cheating”. Hours after the reports of Shatta Michy being thrown out of the house of Shatta Wale, she took to her Facebook account and posted a poster of her new song, “Cheating”. She went on to caption the photo, “My first ever single & trust me you’d like every bit of it with a few lessons to learn dropping vid in a bit wait on it #shattamichy #music#showbiz #Cheating”. The mother of one refuted the claims that were making rounds about her being ‘sacked’ from Shatta Wale’s house when the news first broke. When the ‘cheating’ reports hit social media, Shatta Michy shared some lovey-dovey photos of herself and boyfriend Shatta Wale as a way of rubbishing the claims that had started going viral on the internet. In responding to the cheating claims, Shatta Wale, born Charles Nii Armah Mensah, took to his Facebook page to rubbish the claims with a post. He indicated that, “Bloggers 2018 change ur life and come lets work together ...Your lies deh mek ade get money too much ...Aaaabbba”. Shatta Wale and Shatta Michy have recorded a song together but if news about “Cheating” is true, Shatta Michy will well be on her way to producing her first single.post by Ican.